Shopping for Looney Tunes Cookie Jars? He's ready for blast off! What's that in your hands, Marvin? Ceramic cookie jar features Looney Tunes' Marvin the Martian. Would you trust your savory sweets to this clever villain? 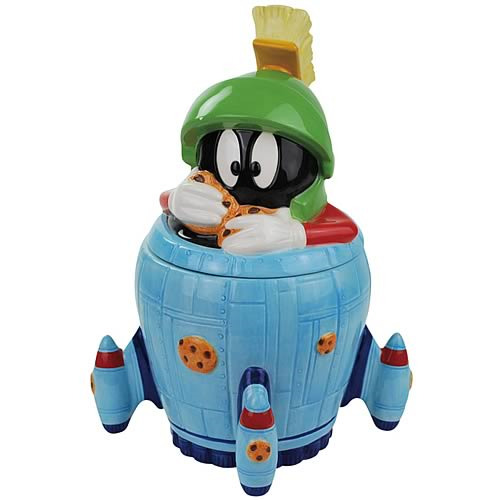 If so, you need the Looney Tunes Marvin the Martian in Spaceship Cookie Jar. This ceramic cookie jar measures approximately 11 1/2-inches tall and features Looney Tunes' Marvin the Martian in his spaceship, fists full of cookies, ready for blast off!